Welcome to the information page for the listening bench installed in Harlow, Essex. Here you can find out more about the clips featured on the bench, and about the volunteers who put the clips together. The clips currently loaded onto the bench give an overview of the history of the site, and describe some of the stages in the development of Harlow New Town, 70 years old in 2017. 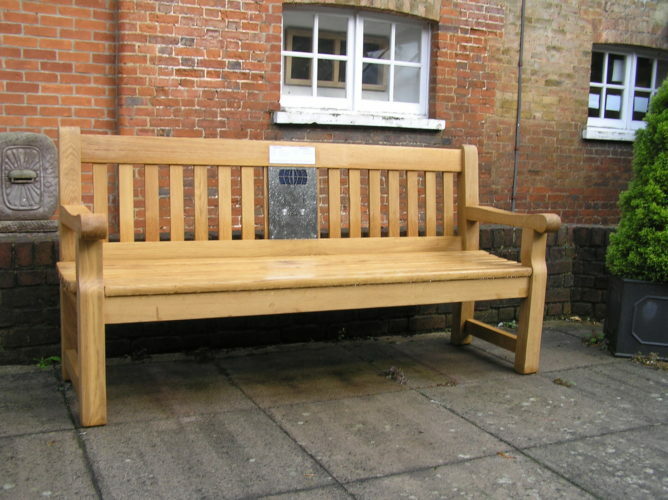 The bench is located in the courtyard of Harlow Museum and Walled Gardens, Muskham Road, Harlow, CM20 2LF. This bench was put together by volunteers at Harlow Museum in collaboration with the Essex Record Office, as part of the Heritage Lottery Funded project, You Are Hear: sound and a sense of place. An introduction to the Mark Hall Estate on which the Museum was built. Information about the Walled Gardens surrounding the Museum. The planning of the New Town at Harlow included educational provision. This clip outlines some of the steps taken in the development of local schools, including an interview with former headmaster of Mark Hall School, Mr Palmer. Taken from a BBC Essex recording broadcast in 1987 (SA 1/74/1). Thoughts on how Harlow New Town developed its own identity, including memories of an architect and early resident who met Sir Frederick Gibberd, and the then manager of the town’s Record Office, Jacqueline Storey. Taken from BBC recordings. How the expectations of New Town residents differed from their actual experiences. Taken from a BBC Essex recording.